I absolutely loved this book and it is one of the most important books that I've ever read! So if you are interested do not hesitate to ask for it, because maybe it will change your life too! Only one condition: please send it back afterwards (or make a bookray from it so that I will receive it back). I like to re-read it once in a while. Women played leading roles in the first Christian communities; Jesus' teachings had a feminist bent; ancient Hebrews worshipped the prehistoric goddess-mother well into monarchic times; and Nazis, with their system of male dominance, were a direct throwback to the Indo-European or Aryan invaders whom they crudely imitated. These controversial ideas and findings suggest the thrust of Eisler's highly readable synthesis. She convincingly documents the global shift from egalitarian to patriarchal... read more --This text refers to an out of print or unavailable edition of this title. 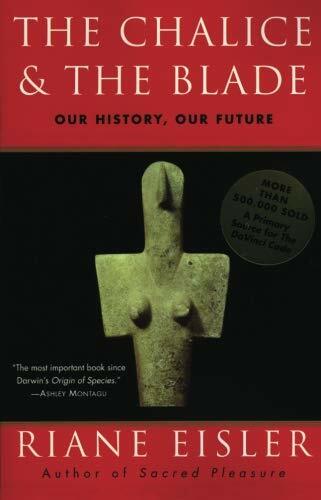 The phenomenal bestseller, with more than 500,000 copies sold worldwide, now with a new epilogue from the author--The Chalice and the Blade has inspired a generation of women and men to envision a truly egalitarian society by exploring the legacy of the peaceful, goddess-worshipping cultures from our prehistoric past. Thank you very much! This book was recommended in the 'further reading' list of "Ishmael" by Daniel Quinn, which deals very much about our past, a large chunk of which we have all but blotted out of our collective memory. I am very keen to do something about that, so I will start reading this very soon and, no doubt, make a ring, for instance to follow after the Ishmael ring. Thanks again, Jesi! I am thankful for the opportunity to read this book. I have learnt a lot from it. Also it has renewed the hope in me to work for a better world. Two of my best friends, also bookcrossers, are going to read this now. After that I will make it into a ring. My two best friends became bookcrossers, too! Every week we have these discussions about the stuff we read and the things we think. We shape and sharpen our minds with each other's visions. I know that they are both highly interested in the matters Riane Eisler writes about and they can't wait to read this. I will offer it to them this evening and, when they both have read it, make a ring in the bookcrossers community. This book went on a nice little site-seeing tour through Deventer, and finally arrived in my house a couple of days ago. I'm halfway the fourth chapter by now, and I must say I'm intrigued. As a former history-student I'm not too optimistic that people actually can learn from the past, but the historical analysis is definitely interesting. History, we were taught, started with the Sumerians. This books adds another perspective to that story, of which I had heard before, but seemingly never really had understood. And - just like when I was reading Ishmael - things are happening, things that make the book pop up in my mind every few hours. Subjects that come up in conversation, things I read... like an article in this months issue of the feminist magazine Opzij. It was about the resurfacing practice of bride-kidnapping in the country of Kirgizië (doesn't that sound a lot like Kurgan to you?). This is supposed to be an ancient nomadic tradition (see!) but women are standing up against it, telling the men they "can't trade a woman like you trade a cow". Makes you think, doesn't it. Thank you for sharing, Jesi and Biba. I'll check in again when I'm finished with the book. This book came back from Niana last week. Since it made such a huge impression on me, I really want to read it again before sending it on in a bookring. Thank you, Jesi, for sharing! And I read it again. Where does it need to go now? This great book goes back home. Thanks a million!